I have a pretty slow turnaround with recipes. In a fantasy world, for every Instagram photo I take of food, I’d link up directly to the recipe already saved here. This doesn’t always happen, but with tonight’s out-of-this-world creation, I have to share this recipe pronto. 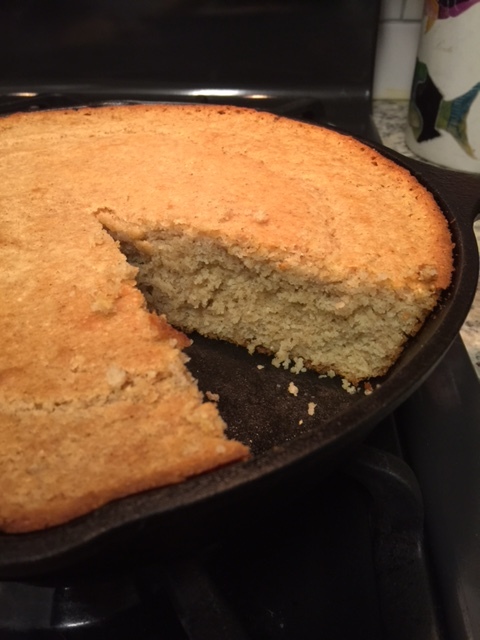 I stumbled upon The New York Times recipe for “brown butter skillet cornbread” about two weeks ago and was finally compelled to make it after work this afternoon. I like to take a brief break where I’m standing up and active between work hours and hours where I try to do some writing. As it’s cold and rainy here, and MainMan’s headed to a golf lesson after he gets off work, I thought I’d whip this up and surprise him when he gets home. I can’t express how goddamn delicious it is. I have made a few cornbread recipes and they always turn out super dry and too salty. This cornbread borders between the perfect side and a course of its own. It is so flavorful. And moist. Wow. The maple syrup really adds a subtle sweetness to the cornbread you never knew you needed and I’ll never make another cornbread again. And for all my friends further north who are still recovering from Jonas, this makes a great blizzard side. I can’t wait to make it for our next camping trip. I agree about this recipe! I also stumbled across it recently and now it’s my go-to cornbread. Even if you cut way back on the butter, it’s delicious. Plus I love anything that can be cooked in a cast-iron skillet.